. Published on April 14, 2019. 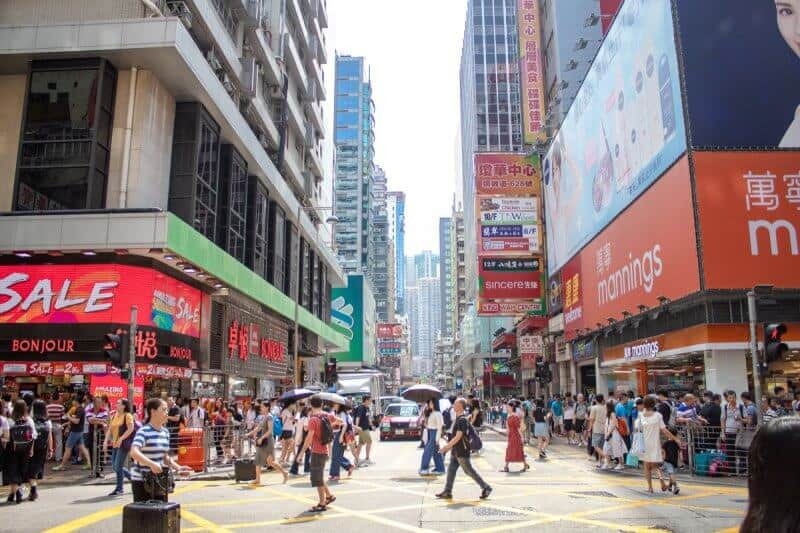 One question I am often asked is whether you should visit Hong Kong in the summer. 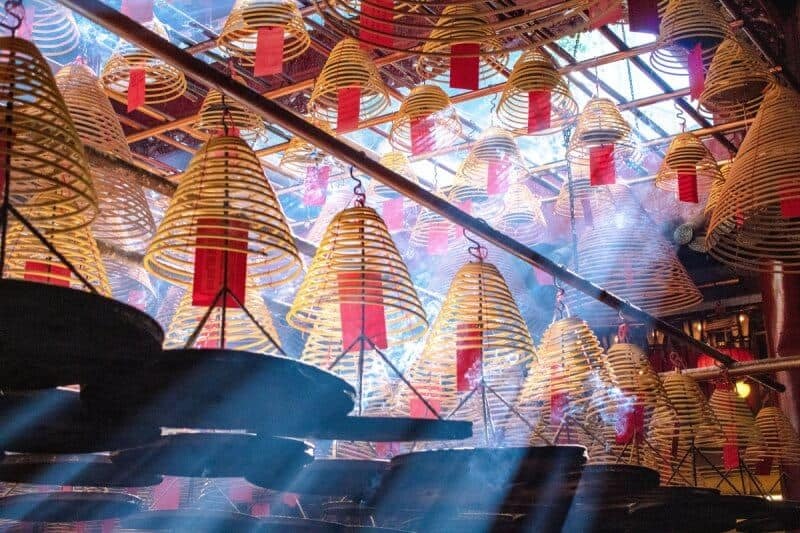 I always advise skipping this time of year if you can (read more about when to visit Hong Kong here). If you’re not a fan of humidity — who is, really — then the summer months are brutal. In the past, I’ve been to Hong Kong in June and October, and even then I found it a bit unbearable. That begs the question, why would I go against my advice and visit Hong Kong and Macau in the summer? The answer is simple: so I can share my experience with you (I also love to suffer, apparently). The main reason was to visit Hong Kong Disneyland for their summer event since I have never done it before. Also to check the new Frozen Suites in the Hong Kong Disneyland Hotel. Instead of simply visiting Disneyland, we made this a week-long trip to relax a bit, too. 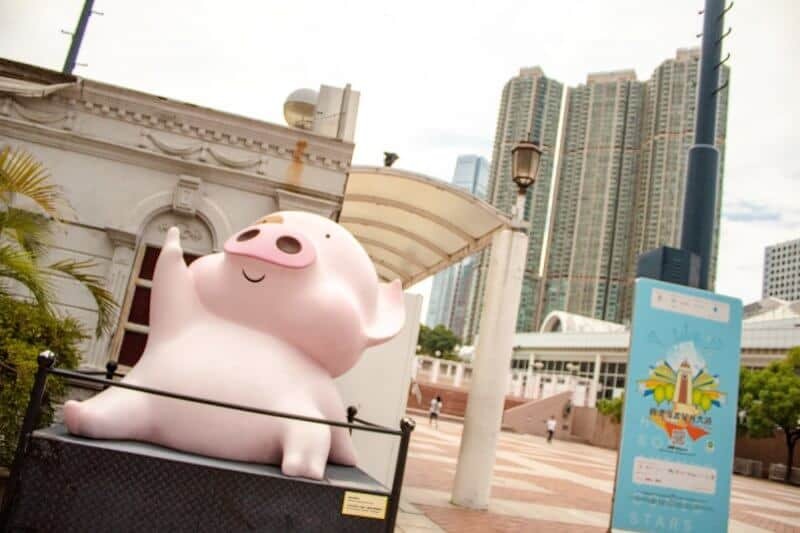 Here’s what we did in both Hong Kong and Macau during the hot and humid summer. For discounts on attractions mentioned here, I recommend our affiliate Klook. My preferred airline from Tokyo to Hong Kong is Hong Kong Express. They are a low-cost carrier and gets the job done. I almost never bring a carry-on or choose my seat (those are both extra charges). I’ll typically fly out of Haneda on the overnight flight (4 hours). Once at the airport, I sleep at the arrivals gate until the trains start running (around 06:00). There’s a space to the left after arrivals at the Hong Kong International Airport where you can lie down (however, it’s not comfortable by any stretch). I always buy a SIM Card through Klook and the counter doesn’t open until 07:00. 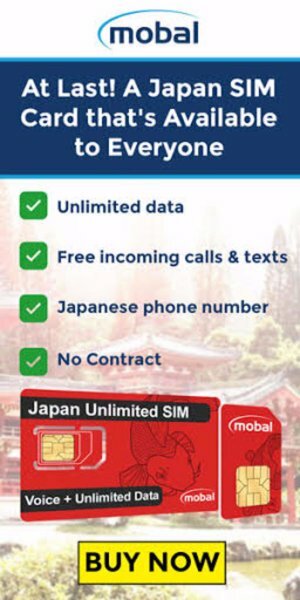 Keep in mind that the SIM card I mention only works in Hong Kong and not Macau. I recommend this wi-fi device if you want to stay connected while traveling between both places. Pro Tip: Planning a trip to all the Disney Parks in Asia? Read our free guide on how to visit Hong Kong, Tokyo, and Shanghai in 2 weeks. Including time in the cities! Another thing I always buy is an Airport Express ticket through Klook to travel from the airport into Hong Kong. 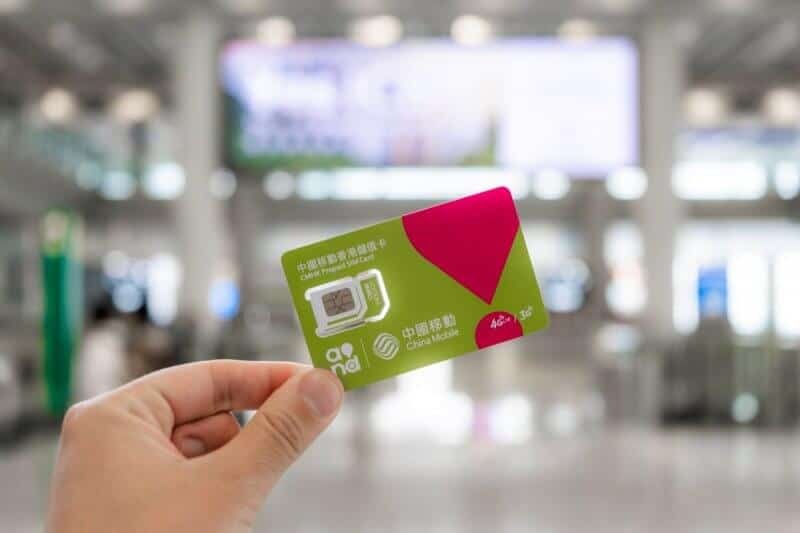 It’s painless and you can buy it even while you’re on the train (you only need to scan your QR code/ticket when you arrive at your destination and not to get on the train). 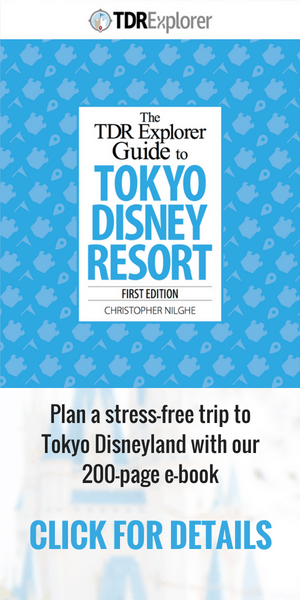 As for Hong Kong Disneyland, plan your trip with our free travel guide. It’ll help you choose what hotel, what the best rides are, how to see all the shows, and tons more. 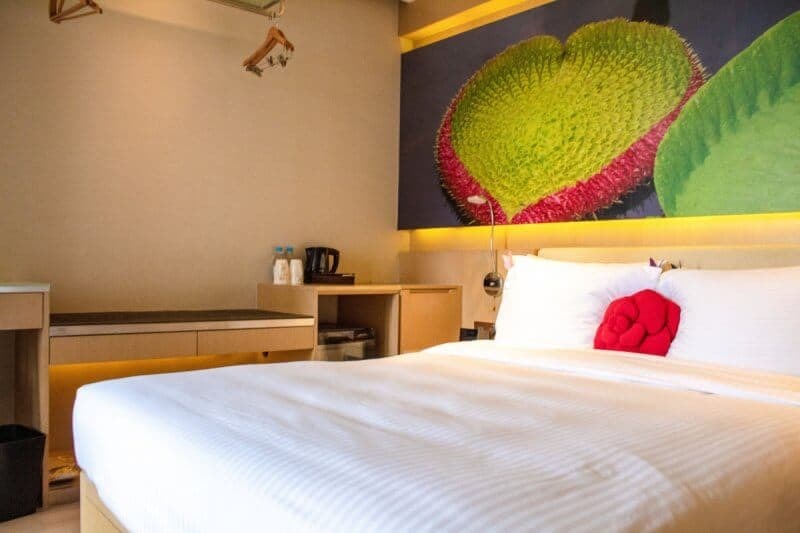 While in Hong Kong we stayed at the Butterfly on Waterfront and the Ibis. Both are walking distance to the ferry for Macau. We wanted an easy way to get to the ferry for Macau without having to travel through the city with our luggage. It’s quick to get to Hong Kong Station on the metro, which has the Airport Express, and easy to get to Hong Kong Disneyland. I’ve never been to Kowloon Park before and I wanted to see it for myself. Despite the intense heat and humidity, it’s a lovely way to spend an afternoon. We spent about 2 hours wandering around. Found plenty of shade to escape the sun’s rays. One of our favourite finds were the sculptures from a variety of cartoon characters that we’ve never heard of before. 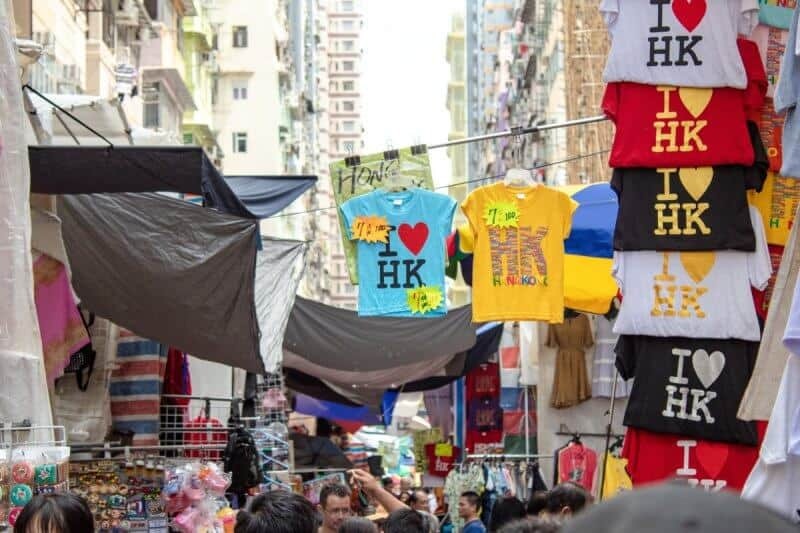 Another great thing about Kowloon is it’s right beside Harbour City (a huge mall with tons of food options) and only a few metro stops from my favourite places, like the Ladies Market and the Gold Fish Market. We took the Star Ferry from Central to Tsim Sha Tsui and walked to Kowloon Park. Taking the Star Ferry is one of the things you have to do at least once while you’re in Hong Kong (I do it every time). It’s a short ferry ride across the harbour, so the chance of motion sickness isn’t high (at least for me). The best part is that it’s cheap and costs only HKD$2.70 or US$0.30. A few metro stations from Kowloon Park (Tsim Sha Tsui) is the Ladies and Gold Fish Markets (Mong Kok). This is where you’ll find pretty much anything you want and barter for it. While I am not the bartering type, Bryson is not shy. He snagged himself a pair of Ray-Bans (clearly, they weren’t authentic) for a fraction of the price of a real pair. Even though it was scorching hot, we walked down the Ladies Market to browse all the wares. You’ll even see knockoff items from Hong Kong Disneyland on occasion. I prefer to buy the real thing but to each their own. It’s fun to walk down the long and sometimes claustrophobic streets and discover things you never knew existed. We took a quick walk through the Gold Fish Market nearby, too. It’s exactly how the name sounds. 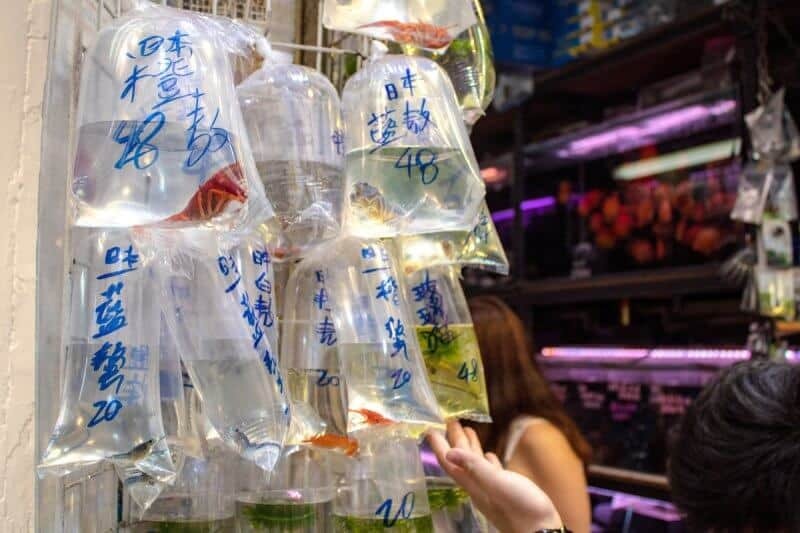 There are endless shops with different types of fish in bags for you to buy and take home. It was rather strange (I felt bad for the fish), but fascinating at the same time. I saw a lot of people buying these bagged fish, and I am assuming, to put in their aquarium to give them a lovely home. Not too far from the Butterfly on Waterfront Hotel is the Man Mo Temple in Sheung Wan. This is one of Hong Kong’s oldest temples — built in 1847 — and is dedicated to the gods of literature and war. I enjoy paying a visit to this temple for the beautiful ambiance created by the burning incense. It’s also worth noting that it’s free. 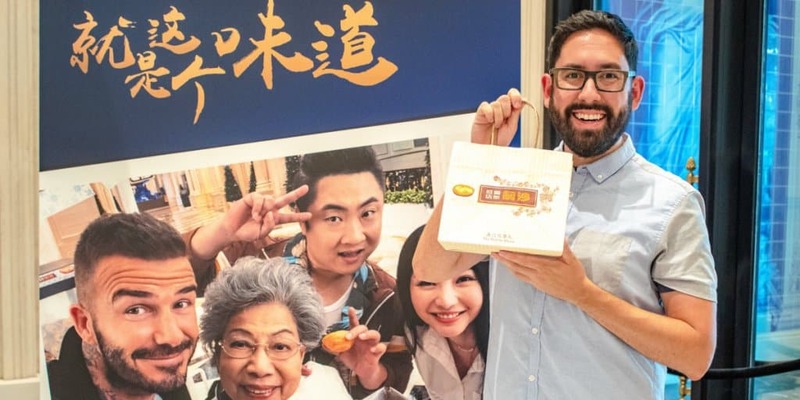 A visit to Hong Kong isn’t complete without having at least one meal at one of the cheapest Michelin-starred restaurants in the world. We went to the place in Central (inside Hong Kong Station), which technically (according to the Wikipedia page) doesn’t have a Michelin star. I’ve dined at the Sham Shui Po restaurant in the past, however, which does have that covenant star. The line was about 30 minutes long, which wasn’t too bad. Once sat down, we ordered the famous BBQ pork buns along with vermicelli noodles with beef. 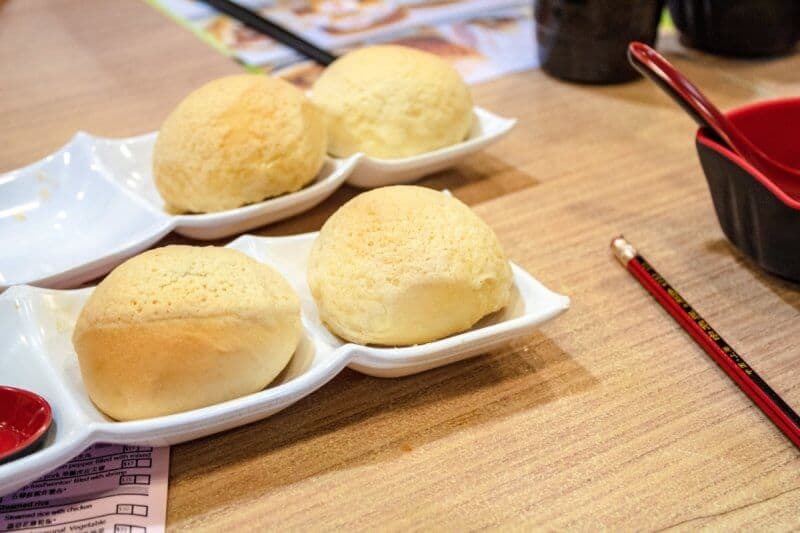 Tim Ho Wan has never disappointed and I can’t recommend it enough while you’re in Hong Kong. Even if you’re a picky eater like Bryson, the BBQ pork buns are delicious for everyone. A young couple beside us ordered chicken feet by mistake. The look of disgust on their faces was priceless. They were nice enough to offer us some to share, but we politely declined. My excuse is that I was already full. I always love visiting Hong Kong and it’s easily one of my favourite cities in the world. 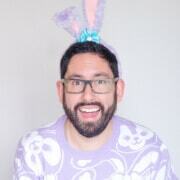 I find it easier to navigate than the sprawling metropolis of Tokyo. If you are able to put up with the humidity and heat in the summer, it’s a fun time to visit. Now, let’s move on to Macau! Hong Kong doesn’t have to be expensive. 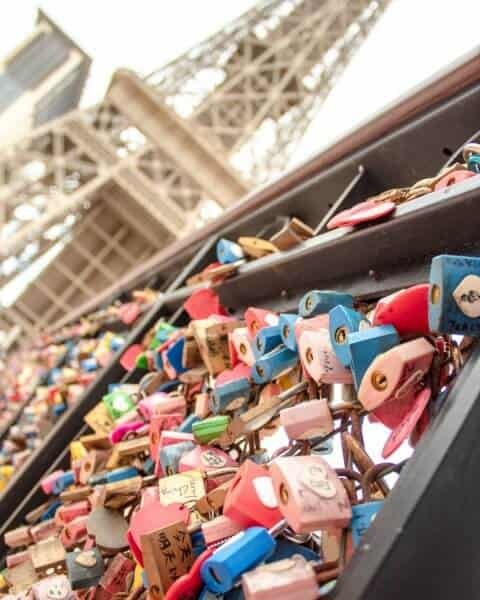 Here is a list of 13 ways you can visit this wonderful city on a budget! For more ideas on what to do, I recommend investing in this excellent guide by Nomadic Matt. 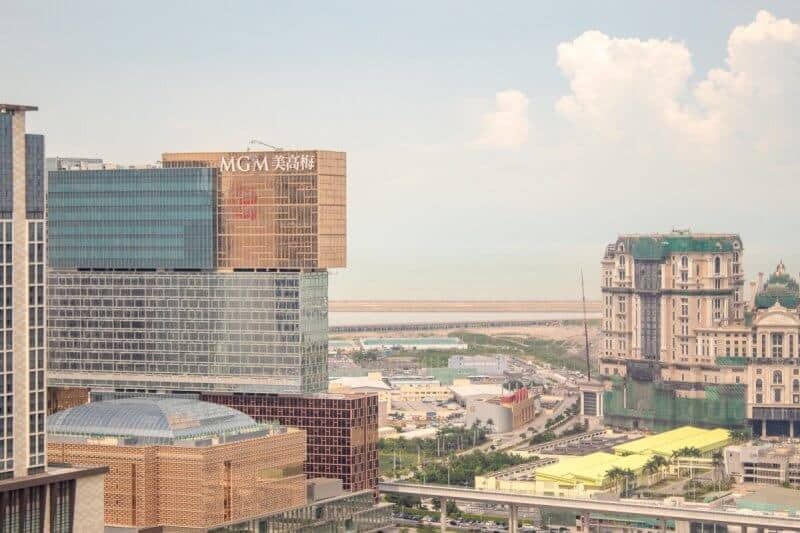 Macau is the Las Vegas of Asia and I highly recommend visiting — time permitting — when you’re on a trip to Hong Kong. There’s quite a bit to do and even some family-friendly attractions. I find it much cleaner than Las Vegas and it’s easy to get around (it’s smaller, so that helps). During our visit, it was on average about 32°C and 80% humidity. The easiest way to get to Macau is by Cotai Ferry (which takes about an hour). We were in the “Central” part of Hong Kong (where you’ll find Victoria Peak) and getting to the ferry isn’t too hard. It’s about a 10-15 minute walk from the hotels we stayed at I mentioned earlier. I always opt for the first class ticket (it’s not much more) and you’ll sit on the top floor of the ferry and you’ll be able to disembark first. First class also has better seats and you’ll get drinks and snacks, too. Get your discount tickets for the Cotai Ferry here. Note: If you’re prone to motion sickness (like me), you’ll want to take some medication. For this trip, the ride was rather smooth and I didn’t get sick. The last time I went in 2017, the motion sickness made me want to upchuck my Tim Ho Wan (thankfully I didn’t cause that food is too good to have it go to waste). The ferry terminal is undergoing major renovations and it’s looking fantastic. It feels like an airport arrivals terminal and is quite modern. You do have to go through immigration since you’re in a different country. Make sure you have your passport on you. Once you’re through, it’s a short walk to the free buses to the hotel. Macau Currency: MOP or HKD? It’s worth noting that Macau has its own currency called Macau Pataca (MOP). Hong Kong Dollars (HKD) is accepted at most places within Macau at an exchange rate of 1:1. You’ll pay about 3% more if you choose to pay with Hong Kong Dollars. We weren’t doing extensive shopping so we paid with Hong Kong Dollars when we used cash. For most transactions, my credit card got a workout. For simplicity sake, just use Hong Kong Dollars. Read more about the currency in Macau. This time we did The Countdown Hotel and I was more than happy with it. For the price (about US$120 per night), I felt like we should have paid much more than we did. Clean, chic, and affordable. My kind of hotel. My only gripe was the food selection wasn’t vast compared to the other hotels. While it did have the Hard Rock Cafe (we ate there just because I want to say I ate there) and a Starbucks, that’s about all that appealed to us. The other hotels have better selections and are a short walk away. With that said, I’d stay here again without a doubt. I recommend checking the official website for the best rates. Also, compare rates on Agoda & Booking.com to find the best deal. Our first night we took the time to explore the various resorts in Macau. There are free shuttles connecting them all, but it took forever to get anywhere. The route the bus takes feels like you’re going in circles to get from resort to resort, of which I am not a fan. After our first bus ride, we opted to walk instead. Most of the resorts are within walking distance to each other. We made our way over to the Galaxy Macau resort and decided to watch Christopher Robin. The reason for that was the movie didn’t come out until September in Japan, and I’m impatient. The movie was in English with subtitles, so there were zero issues watching it. In case you’re wondering, I absolutely loved it. For dinner, we made reservations for Terrazza Italian Restaurant, a Michelin-starred restaurant in Galaxy Macau. This was my second time eating here and it didn’t disappoint. Even our host, Diane, remembered us from our previous visit. While it’s a bit pricey, the quality of the food is worth it. They’re only open for dinner, so I recommend making a reservation either by phone or going to the restaurant a few hours beforehand. We made our reservation before the movie. Everyone speaks English, so no worries there. We called it an early night to gear up for our full day in Macau. During this trip to Macau, we didn’t do much outside the resort area, mainly due to time and the heat. Hopping between resorts while going outside was more than enough for us. 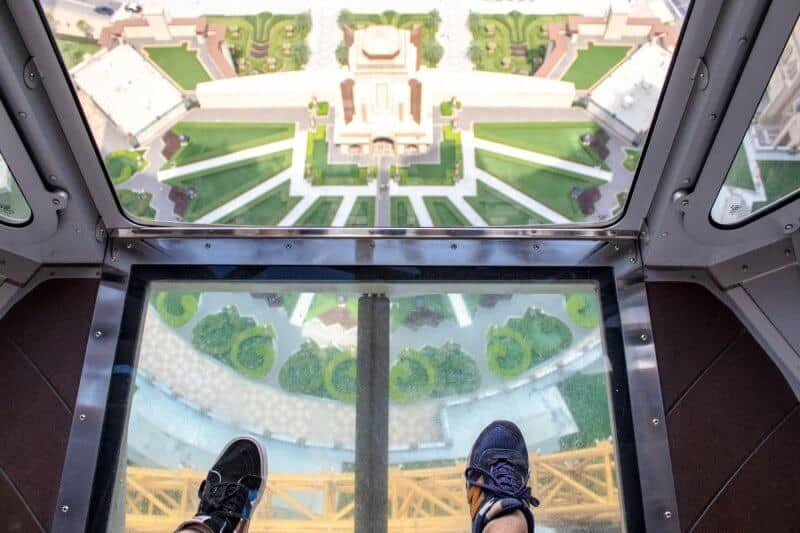 The strangest thing we did was go up the half-scale Eiffel Tower at The Parisian Macao. 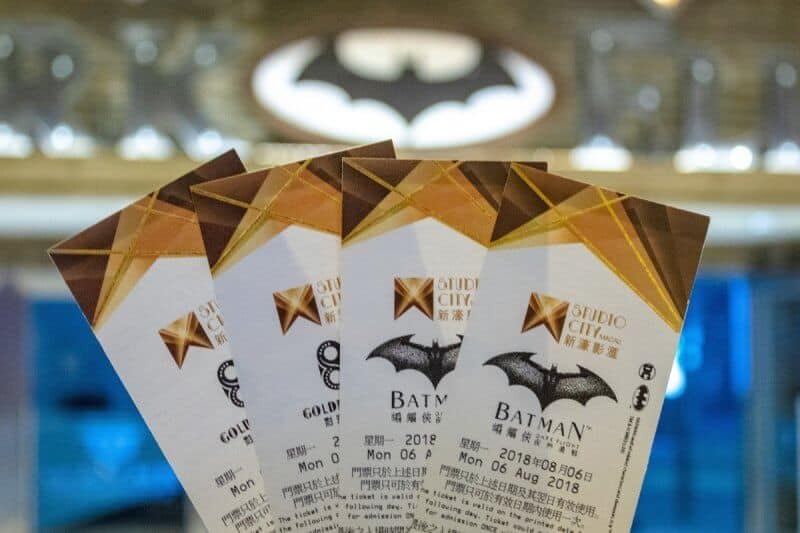 While it wasn’t anything spectacular, it was fun to say we went up the “Eiffel Tower.” Over at Studio Macau, we got ourselves the “Ride and Fly Entertainment Pass” for 200 MOP (US$25) and did the Golden Reel (Ferris wheel built into the hotel) and the Batman Dark Flight. The Golden Reel was relaxing and a great way to see the area from above. As for the Batman Dark Flight, that was something else. Think of it as Soarin’, but with Batman instead and more intense. After the pre-show, which is clever, you’re seated in a theatre and dangled in front of a screen. Instead of soaring over the Matterhorn or glaciers, you’re flying through Gotham City in every which way imaginable. The motion made me motion sick to the point where I couldn’t enjoy the experience. All I wanted was to stop before I threw up all over the lovely young family in front of me. If you’re prone to motion sickness, then I recommend skipping this entirely. However, from what I was able to enjoy in the beginning, it’s a decent attraction. While on the ferry to Macau, an advert played featuring superstar David Beckham. The commercial shows the football star enjoying an egg tart (a famous pastry). 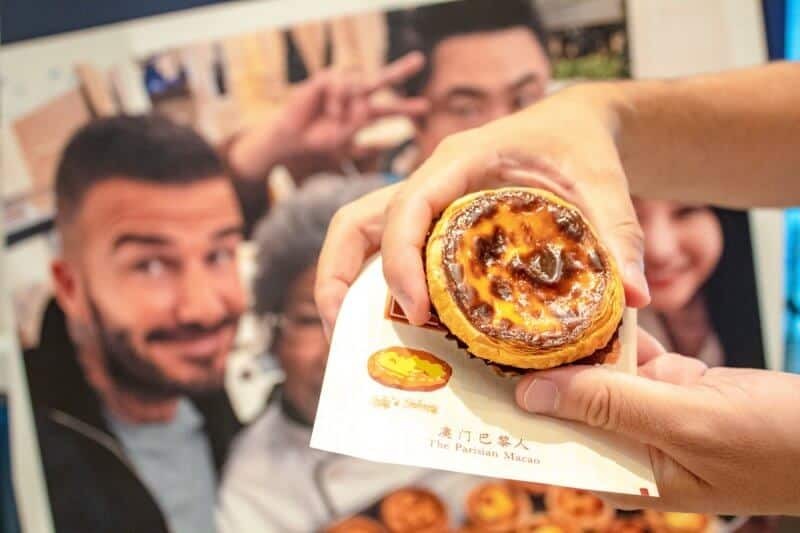 Since I am a sucker for advertisements, we sought out “Sally’s Egg Tart” in The Parisian Macao. The egg tart did not disappoint and I even had two! 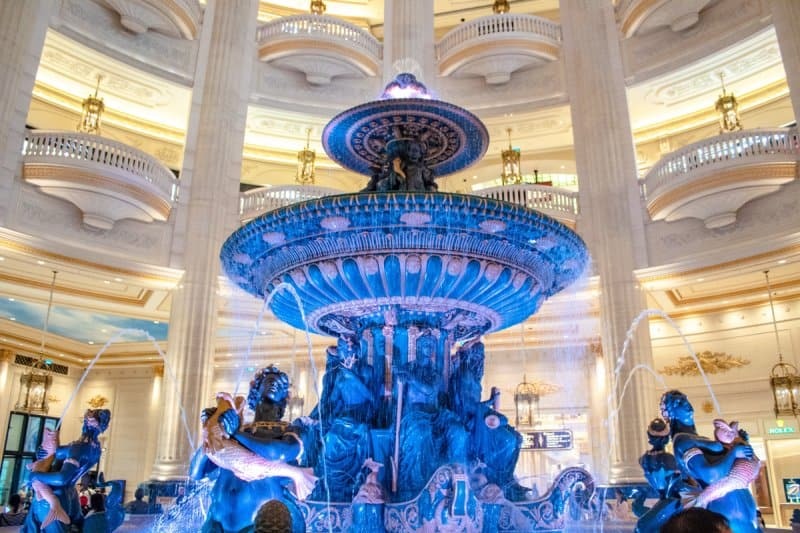 The highlight of the entire Macau trip was The House of Dancing Water. This water-based stage production is worth the trip to Macau, without a doubt. It features a transforming stage, breathtaking water effects, acrobatics, and tons of talented performers. The 90 minutes went by quickly, but it was time well spent. If you’ve seen any Cirque Du Soleil shows, then you’ll enjoy this production. 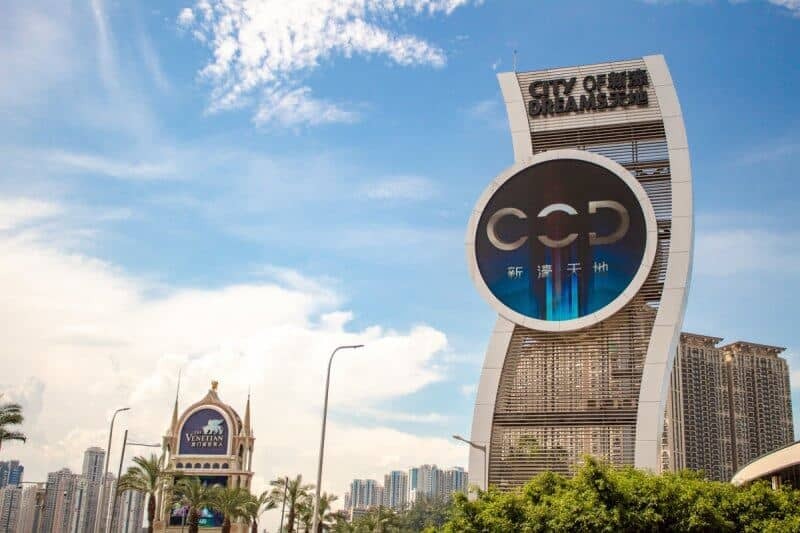 It makes for a great night out and it’s right in the City of Dreams – Countdown Hotel, so you don’t have to go far. Save yourself US$10 off tickets by buying yours through Klook. The best seats are in section A, which are also the most expensive. We sat in section B and the view was perfectly fine. I wouldn’t sit in section C unless you have no choice. Check out the seating chart on the official website. Overall, Macau was great on my second visit. I think it’s definitely worth the trip, even if you don’t gamble (I’m not a gambler myself). Spending 1 day and 2 nights make for a quick but fun trip. For more on Macau, I recommend this guide. If you’re planning on visiting multiple attractions in both Hong Kong and Macau then I highly recommend this pass to save yourself money! Are you interested in us writing our own guide to Macau? Let us know in the comments!